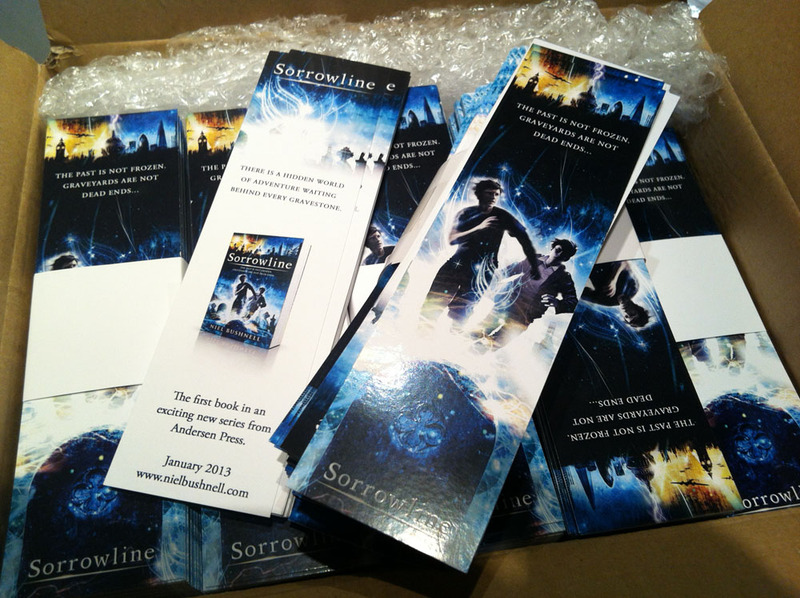 Sorrowline has been on its travels, to the Frankfurt Book Fair no less. Billed as the world’s largest book fair its the place to be for agents and publishers to sign new books. Its not really a place for authors, its all about the business! My literary agent, Juliet Mushens was there with Rachel Mills, Foreign Rights agent for PFD, and saw dozens of publishers from around the world. Sometimes deals are done there and then, but more normally its the start of a conversation that might eventually lead to an agreement. That’s how it is for Sorrowline right now. Juliet has had several interested publishers, and she’s in the middle of taking things further – hopefully that will mean some other foreign editions to add to the English, Brazilian and German versions. And the bookmarks went down a storm!! There’s talk of a book launch event happening in Newcastle some time in the New Year! The whole idea of events is pretty daunting and exciting. I’ve done events in the past, spoken in schools and colleges, ran workshops, but this feels different. Its more personal I suppose. So the New Year is going to be a really weird learning curve. The first draft of book two is entering the home stretch. Its been a different experience this time round, writing with the knowledge that this will be published, but I’ve tried to forget about that for now, at least until I’ve got it completed. Things are starting to get exciting! In the last 10 days I launched my Facebook author’s page and its managed to get over 80 ‘likes’ already. I’m really grateful to everyone who has sent me messages of goodwill there too. Two parcels came last week that cheered me up as well. The first was the proof copies of Sorrowline, sent from my publisher, Andersen Press. This is my last chance to make sure I’m happy with everything. I’m not expecting major changes now, that work is pretty much done, but its a chance to catch those last elusive typos or errors. Yesterday I had a lovely lunch with Ruth Knowles, my editor at Andersen Press, Eve Warlow, Andersen’s book publicist and my agent, Juliet. It was fun to talk about what’s going to happen next, to hear about Andersen’s ideas to promote the book and to speculate on some ‘what ifs’. 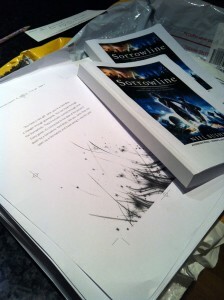 I was also thrilled to hear of some very positive noises from other authors connected with Andersen who have already read Sorrowline. But best of all it was a free lunch, which is always nice. Sorrowline bookmarks – 2500 of them! And finally, I’m three quarters into writing the sequel to Sorrowline, called Timesmith. It takes the world established in Sorrowline and pushes at the dark edges to reveal new characters, new locations and new dangers. I’ve been told off for smiling gleefully every time I mention killing off characters. Apparently I’m enjoying it too much! Last night I was up to chapter thirty two, about a hideous creature who was once a… well, maybe that’s enough for now. I don’t want to spoil it for you, do I?